Perhaps the most famous of Sir Arthur Conan Doyle's Sherlock Holmes mysteries is The Hound of the Baskervilles. Big Finish Productions has adapted this fantastic story into a dramatic audio production. Sherlock Holmes: The Hound of the Baskervilles is a nail-biting two hour long audio drama. The story jumps right out at you in just the first few minutes. A classic case with the legendary detective sweeps into a mystery that will surely keep you on the edge of your seat. As with the majority of the Holmes stories, in this adaptation we see the case from Dr. Watson's perspective. Young Dr Mortimer ventures from Devonshire to Baker Street, with news of the death of his friend, Sir Charles Baskerville. Can it really be that the grisly legend of the Hound of the Baskervilles might have something to do with the case? Holmes will have none of it, but even he must accept that dark forces are at work. Dark forces that it seems Dr Watson must face alone. This production was credited as written by Sir Arthur Conan Doyle and adapted by Richard Dinnick. It was directed by Nicholas Briggs and Ken Bentley, and stars Briggs as Sherlock Holmes and Richard Earl as Dr. Watson. The audio drama script was adapted from a script originally written for a stage production. 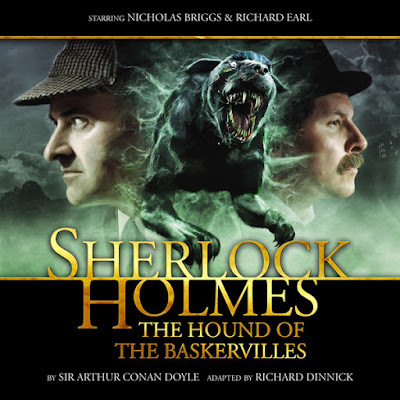 The opening scene in part relates the history of the Baskervilles, a family that has been allegedly haunted for generations by a terrible beast. Monologues like these (and when characters are reading letters) are often called "info-dumping." Audiences often dread such instances of info-dumping for their stigma of being mundane. This is often information we need for the setup of future plot points, especially in mystery stories. However, in this adaptation of The Hound of the Baskervilles, we are very fortunate because such narrations are made very entertaining. This opening scene is a great example of this. It keeps the story interesting and dramatic while setting up the rest of the story in classic Arthur Conan Doyle style. The story is very ominous, as one of the cast members says in an interview (which is included as bonus content in both the download and CD versions of this production). 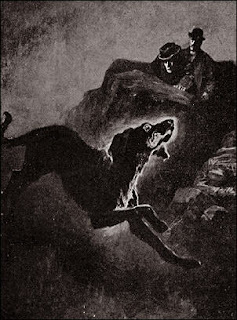 The Hound of the Baskervilles is a mystery surrounding the death of Charles Baskerville. As the story is rather tense and involves death, it is probably not a production that is especially well-suited for young children. That said, the tension is built up well and it kept me on the edge of my seat. We are constantly given just a bit of information—the door opens and for a moment we catch a glimpse of what's "inside". Then the door slams shut and we're once again anxiously trying to figure out what's on the other side. The medium of audio drama is a great fit for the mystery genre and it handles it so much better than most other art forms. 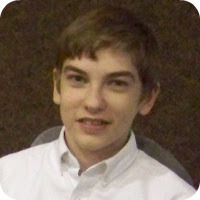 This production uses sound and music expertly to help our imagination follow along with the story as it unfolds. 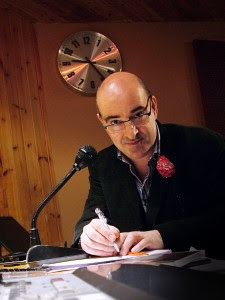 A teasing glance at the unknown, but only a glance, now and then, and a sense of peril are key components in raising tension for the listener. The Hound of the Baskervilles employs these classic story elements superbly. In terms of production quality, the directors, Nicholas Briggs and Ken Bentley, put together a high quality production with a smaller budget than they normally work with. Several actors played multiple roles in the story. Due to the actors' convincing performances, this does not create confusion. The sound design is particularly fantastic in a few scenes in the latter half of the drama. The soundscapes put you straight into the same world that surrounds Dr. Watson. The classic Conan Doyle mystery is not just recreated, but heightened by this dramatization. The titular hound of the Baskerville family that lives on the moor is the perfect device for an audio drama. Its mysterious howl is an audible icon; one which we can immediately understand. This shows off the craftsmanship with which Big Finish Productions created Sherlock Holmes: The Hound of the Baskervilles. The story is masterfully adapted to the audio drama medium. Final word for parents: this production is only caution-worthy in its plot revolving around death—a mystery surrounding whether or not there was a murder. There is a death which is observed after the fact, and briefly described in a few words which are fairly gruesome. Overall, if you are looking for an adaptation to enhance your enjoyment of the original Sherlock Holmes story, or perhaps just a well-made, mystery audio drama, you will certainly want to pick up a copy of The Hound of the Baskervilles! For full credits for the production or to purchase directly from Big Finish, click here.